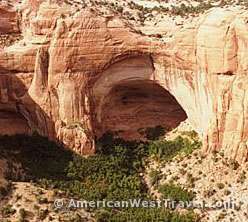 Navajo National Monument in northern Arizona offers guided tours of two outstanding cliff dwellings dating to the 13th century. Rangers lead a guided hike to the photogenic Betatakin cliff dwelling. 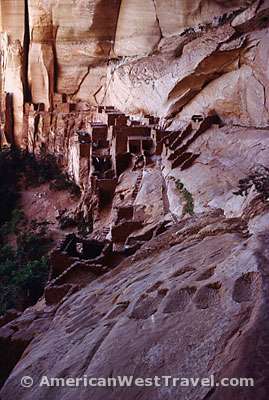 They also lead guided tours into the remote Keet Seel cliff dwelling (Photo, top). However you must hike to that site on your own. It is eight tough miles each way through very rugged but scenic canyon country. 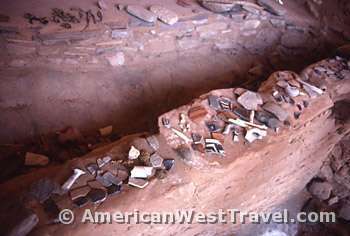 Read our overview in Betatakin and Keet Seel – Outstanding Cliff Dwellings, Navajo National Monument for tour information and reservations. I recently found the following journal which covers our trip to Navajo National Monument in 1985. The narrative describes in detail the trips to both Betatakin and Keet Seel. 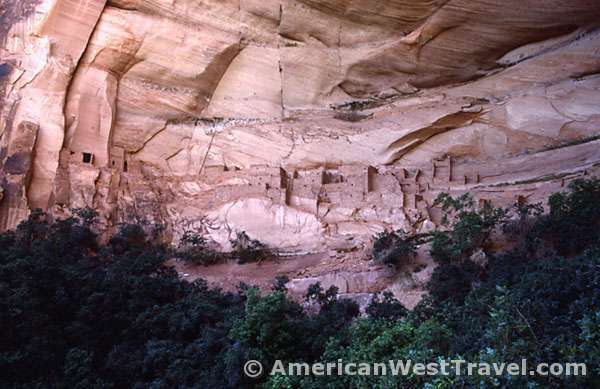 Friday, June 21, 1985: Today’s goal is Navajo National Monument where we plan to tour the Betatakin and Keet Seel ruins. The drive is very similar to the last trip – via Hurricane, Kanab, and Page. This time we go north through Zion National Park rather than Pipe Springs. We stop for a picture at Zion’s Checkerboard Mesa, and it’s freezing – in the 40s – a contrast of almost sixty degrees in twelve hours. We proceed to Page and again have breakfast at the Holiday Inn and tank up at the same Chevron station. We reach Navajo National Monument around noon, got out Keet Seel hiking permits for tomorrow, and sign up for today’s 4:00pm ranger-guided hike to Betatakin. We go over to the campground which is virtually empty, and have plenty of fine sites to choose from. Deep in the canyon the ruin site is beautiful. The area is laden with springs, and is therefore dense with lush vegetation unlike the surrounding desert. As is usual for cliff dwellings, the site was in a deep alcove in the south facing canyon wall. The main section of the pueblo is on a steep ledge, the buildings packed so closely together that there were no passageways. The original inhabitants got around by climbing from roof to roof or by footholds carved in the cliff wall. Present-day access is limited to ledges and stairs constructed by the National Park Service. Tourist access is mainly in the center where the buildings were long since destroyed by a large rock fall. Where the surviving rooms are packed together, the surviving roofs are far too fragile to walk on. This is the first ruin I’ve ever seen that has intact buildings including complete roofs. There are very few artifacts at Betatakin, probably due to the steady flow of tourists. What remains are a few scattered potsherds (pieces of clay pottery). The park visitor center has numerous magnificent examples of intact pottery and other artifacts. 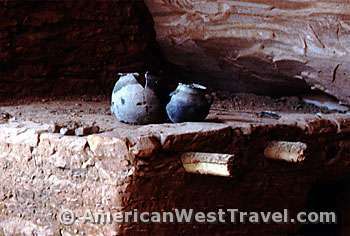 The highly advanced pottery was a hallmark of the Anasazi, as well as their magnificent stone settlements. One of the more interesting devices I saw were several sets of rock boxes with grinding boards (metates) built into them. Apparently the Indians ground their corn directly into these boxes which then probably served as community storage bins. They also had many storage rooms which probably held ears of corn and squash. The hike back was especially enjoyable because Ranger Ed and I hit it off and spent the entire walk back discussing topics of mutual interest – Indian ruins, places to visit or hike in Canyon Country, etc. In the evening there was a campground done by the resident Navajo ranger. He had some Navajo tea for people to try and also sang for us before giving the slide show about native plants. Saturday, June 22, 1985: One of the memorable days in my career of outdoor adventures! A great hike, a great canyon, a great and probably unique ruin. The hike is about seventeen miles round trip which will be a new one-day record for us. We’ve gone fifteen miles in one day twice before, with full packs, but it was all downhill. Here we will have to climb one thousand vertical feet out of the canyon at the very end when we will be the most tired. The actual canyon is a labyrinth of many major side canyons. There are posts with markers indicating the correct side canyon to enter, Keet Seel Canyon. The canyon bottoms are true desert canyons, not riparian like at Grand Gulch. The bottoms are in arroyos, deep gullies eroded into the original canyon bottoms. This is thought to occur due to overuse and long term weather changes. The canyon may have been lush and riparian when the Anasazi flourished here. The walk up the canyon features several pretty waterfalls including one that’s about one hundred feet over a sheer cliff. The last part of the hike is on a bench above the canyon bottom. There are some ups and downs plus a lot of loose sand making for somewhat unpleasant walking. 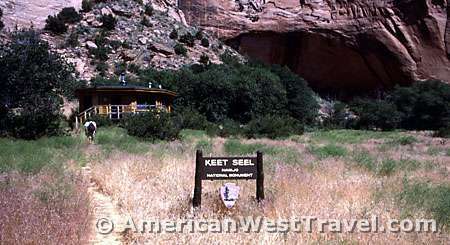 Keet Seel is in a great alcove situated in a small side canyon, actually more an indentation, and faces south as most cliff dwellings do. There is a spring in this area and hence an oasis. There are grasses growing in the fields which were apparently once farmed by the Anasazi. Closer to the wall are large trees with ideally placed picnic tables for lunch. 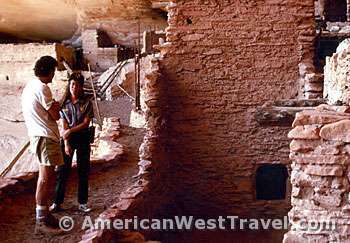 A resident ranger lives in an adjacent Hogan (Navajo-style building) and leads the tours of the ruin. The ranger, a young woman named Marcie (Photo, below), took the two of us on our own personalized tour of Keet Seel, which lasted about an hour and a half. The cliff dwelling sat in the alcove which was about thirty feet above the canyon bottom. Access to the alcove was by a ladder. The site’s ancient garbage piles, or middens, sat at the base of the wall. There were piles of potsherds (broken pieces of ancient pottery) lying all over the ground. They included numerous large pieces; one piece was about six inches long. The variety of pottery design was amazing. They included braiding, multi-coloring, and intricate designs. Some pieces were painted on both inside and outside. Some still had handles attached. Many pieces had a polished, shellac-like finish to them. The volume of potsherds within the alcove was also tremendous. The park service was kind enough to leave a couple of nearly intact pots on one of the rooftops. There were a couple of boxes containing jewelry pieces, arrowheads, cutting edges, and every sort of small artifact. There were corn cobs lying around everywhere, as well as stems from squashes. One room had a gigantic pile of corncobs. Many of the rooms still had their original roofs intact including the outer layer of plaster. There was much more walkway space here than at Betatakin. However the masonry was more haphazard. The walls seem to have been of lower quality, and the layout had a more thrown-together look. The site looked like it was abandoned a lot more recently than 700 years ago. The limited visitation policy perhaps has something to do with it. More people probably see the major ruins at Mesa Verde in a day than see Keet Seel in a year. This story wouldn’t be complete without some comment about Ranger Marcie. I drew her out and got her to talk extensively about herself and her way of life. She grew up in North Dakota and has been accustomed to a rural, outdoor lifestyle all her life. (That seems to be the case with most rangers and outdoor enthusiasts I’ve met.) As a seasonal ranger she is unemployed several months a year. Given the rather low pay of rangers to begin with, this must lead to a less than materialistic lifestyle. It is easy to respect a person like Ranger Marcie who practices what she preaches: to live the rural, outdoor life at the expense of material comfort and security. The Keet Seel tour ranger has perhaps the ultimate outdoor situation, living in the canyon miles from civilization. It is the task most desired by the rangers at the monument. Each ranger takes a turn at an eight day stint as tour guide at Keet Seel. The tour ranger lives in a three room Hogan adjacent to the ruin. The only contact to the outside is via walkie-talkie. There is no phone, electricity, TV, radio, etc. They do have a propane stove and cooler. When the tour day is over, the ranger is totally alone in this wilderness. But back to Ranger Marcie. I want to mention her refinement and dignity, her obvious fulfillment with what she is doing with her life. In this respect, I felt 180-degree opposite. However for what it’s worth she thought that if brought up in an urban lifestyle like me, she, too, probably wouldn’t be able to drop it all and do the opposite. The hike back to the campground was easier than I expected. We followed the wash for the first two miles instead of going up on the bench. There were a couple of minor waterfalls to negotiate and a stretch of narrows with a lot of quicksand which was pretty messy but not too strenuous. The walk up out of the canyon was not too bad although the going was pretty slow in the sandy areas. Reaching the top, there was a fellow from Austin, Texas at the corral area, a novice hiker with lots of questions about the trek. We were pretty friendly, and he gave us a ride up the last lousy mile of the road. We still set a personal record for most miles walked in one day, a total of sixteen miles. After dinner we went to the campfire talk and heard Ranger Dale Hously (who I originally talked to when making the hiking reservation) give a witty talk on geology and the natural history of the area. Sunday, June 23, 1985: We leave Navajo National Monument after breakfast. I want to comment on what a fine experience this has been here: uncrowded, a pleasant campground, good campfire talks, great rangers, two great hikes, and a unique ruin. The experience here stands a cut above all the other National Park Service areas I’ve been to. 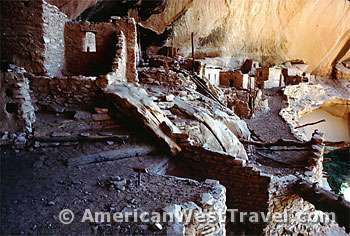 Our next destination is Mesa Verde National Park. That is a major tourist area which probably won’t be as nice as this has been. Return to Betatakin and Keet Seel – Outstanding Cliff Dwellings, Navajo National Monument.